Prof. Noam Adir, Dean of the Schulich Faculty of Chemistry. 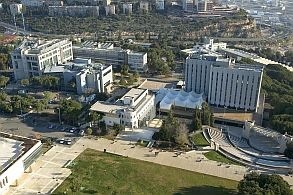 A study from the lab of Prof. Noam Adir of the Schulich Faculty of Chemistry at Technion – Israel Institute of Technology: natural evolutionary processes prevent the presence of dangerous and potentially lethal molecular interactions by avoiding the presence of specific protein sequences in microorganisms. They found these sequences by a novel method – looking for what is missing in biological data sets. The group then experimentally showed that when these sequences are present in a protein, bacterial growth is indeed inhibited. The study was recently published in the Proceedings of the National Academy of Sciences, USA. Evolution is an ongoing process, whereby those individuals of species that are the most fit for their environment have more offspring and thus out-compete less fit individuals. The individual’s fitness is a product of the quality of its cellular biochemistry, made possible by the thousands of enzymes that allow its physiology to perform all of the necessary chemical reactions that allow the cell to live. Deficiency in these molecular functions can lead to disease, loss of adaptability to environmental changes, or weakness against other organisms. The molecular machines that make life possible are large polymers made up of linear sequences of building blocks that contain different chemical functions: proteins, DNA, and RNA. Biological variety is a result of the evolutionary changes in these polymers, first and foremost the result of the astronomic number of possible permutations in the order of the 20 naturally occurring amino acid (AA) residues that are the building blocks of proteins. There are 8,000 possible sequences of three AAs, 160,000 sequences of four AAs, over 3 million sequences of five AAs and so on. Since proteins can contain between hundreds to thousands of AAs, the possibilities are endless. The millions of different protein sequences found in all organisms determine the three-dimensional structures that give proteins the ability to function correctly. Proteins in cells can work alone or associate correctly with other cellular components, while avoiding incorrect and harmful associations with other components. Changes to the sequences naturally occur due to mutations (single site, or larger changes due to more dramatic sequence shuffling) of an organism’s DNA – the genetic material. Changes due to mutations can lead to new positive characteristics, or they may have negative consequences to the organism’s viability. A mutation that has a negative effect may prevent the organism from competing with other organisms in its environment, eventually leading to its demise. One could predict that over time, evolutionary pressure would work against the presence of organisms containing these internally lethal sequences and they would disappear. Over the past few years, there has been a world-wide effort to obtain the entire DNA sequences (the entire genomes) of many organisms. These data have given us the ability to predict all of the possible protein sequences (the proteome) that might exist in organisms as simple as bacteria or as complicated as humans. Prof. Adir and his students, Dr. Sharon Penias-Navon and Ms. Tali Schwartzman, hypothesized that the huge amount of data made available by modern genomics would allow them to look for short sequences that occur less often than expected or are completely missing in the organism’s proteome. They developed a computer program that searched the many existing data sets to identify short sequences that are underrepresented (URSs). While they found that most of the sequences of three or four AAs indeed do exist at their expected frequency in the proteins of different organisms, URSs do exist. They used the program to search for URSs in the proteomes of many different organisms (especially pathogenic microorganisms) and found that different organisms have different URSs. Adir and Penias-Navon wanted to prove that these URSs are indeed harmful, and they hypothesized that protein synthesis (translation) by the ribosome is the function that URSs might harm. They embedded bacterial URSs (identified in the proteome of the gut bacterium E. coli) comprised of three or four AAs in a normal protein sequence, and showed that no matter where they put the URS, protein translation was inhibited. They showed that these same E. coli URSs had no effect on protein translation in human cells, showing that the effect is species specific. They further showed that one four-AA URS was powerful enough to inhibit translation completely to the point where the growth of the bacterial cells was significantly reduced: these are indeed lethal sequences. Adir and Navon suggested that URSs could be used as highly specific anti-microbial agents, and a patent, together with the Technion, was submitted. In order to obtain even more precise molecular details on the action of the URS, they initiated a collaboration with Prof. Joseph Puglisi and his student Dr. Guy Kornberg of Stanford University, who are experts in following protein translation in single ribosomes, thereby obtaining direct information on the translation reaction mechanism. Using these single molecule methods, the inhibitory effect of the existence of a URS on translation was confirmed. Their methods enabled a precise determination of the site of inhibition. 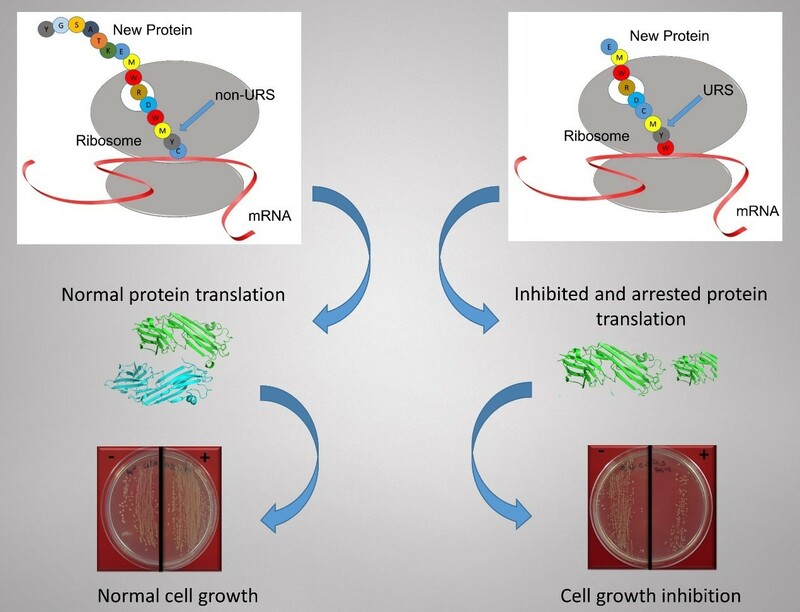 They found that as soon as the URS AAs enter the entrance to the ribosomal nascent protein exit tunnel, translation is inhibited. By tracking this pathway, known as malic enzyme metabolism, which is one of a few recognized routes to make NADPH, researchers from Rabinowitz lab discovered a novel switch in the way fat cells make NADPH depending on the presence of oxygen. The findings were published* in Nature Chemical Biology. “No one had ever shown an environmental dependent switch in any NADPH production pathway,” said Joshua Rabinowitz, Professor of Chemistry and the Lewis-Sigler Institute for Integrative Genomics at Princeton and principal investigator of the work. “No one had the tools to look,” he said. The Rabinowitz lab first applied their tracer method in 2014* to study the most well known NADPH production pathway, the oxidative pentose phosphate pathway (oxPPP). The method relied on compounds labeled with deuterium atoms, hydrogen’s heavier cousin, which can be deployed in the cell and measured by a technique called mass spectrometry. “It’s like the cells are quite clever. They choose the pathway depending on what they want to make, and what nutrients they can access,” said Ling Liu, a graduate student in the Rabinowitz lab and lead author on the work. NADPH involvement in essential cellular processes has a direct impact on diseases such as diabetes, obesity and cancer. “All of these central biomedical questions depend on an understanding of NADPH pathways, and if you can’t quantify how a metabolite is made and used, you can’t understand what’s going on,” Rabinowitz said. 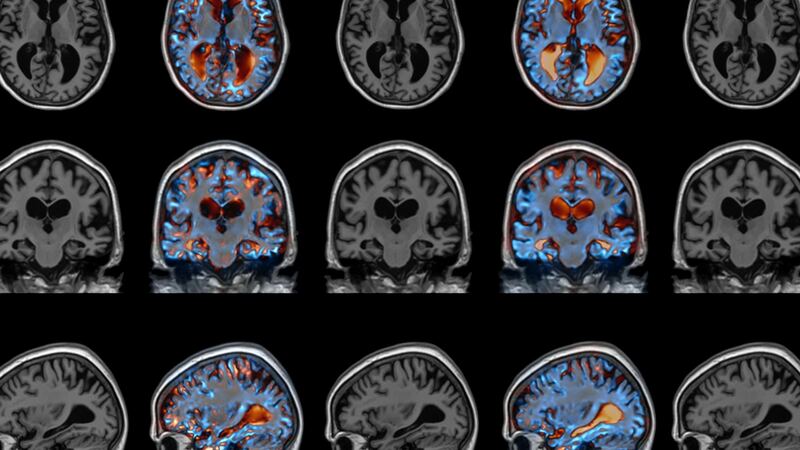 “Ultimately, we’re trying to understand the fundamental chemistry that’s leading to these important biological outcomes,” he said. Liu, L.; Shah, S.; Fan, J.; Park, J. O.; Wellen, K. E.; Rabinowitz, J. D. Malic enzyme tracers reveal hypoxia-induced switch in adipocyte NADPH pathway usage. Nat. Chem. Bio. Published online March 21, 2016. Department of Cancer Biology, University of Pennsylvania, Philadelphia, Pennsylvania, USA. Diabetes Research Center, University of Pennsylvania, Philadelphia, Pennsylvania, USA. J.D.R., K.E.W., L.L. and J.F. conceived the project. L.L. performed and analyzed most experiments. 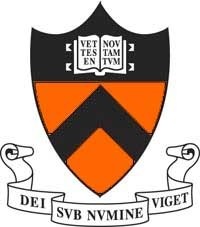 L.L., J.O.P., J.F. and J.D.R. conducted the flux analysis. S.S. performed electroporation experiments and analyzed the data. J.D.R. and L.L. wrote the manuscript. J.F. and J.D.R. conceived the study. J.F., J.Y., C.B.T. and J.D.R. designed the experiments. J.F., J.Y. and J.J.K. performed the experiments. T.S. and J.F. conducted the computational analyses. J.D.R. and J.F., assisted by J.Y., T.S. and C.B.T., wrote the manuscript. How did life originate? And can scientists create life? These questions not only occupy the minds of scientists interested in the origin of life, but also researchers working with technology of the future. If we can create artificial living systems, we may not only understand the origin of life – we can also revolutionize the future of technology. If one daughter cell after a division has a slightly altered information (maybe it provides a slightly faster metabolism), they may be more fit to survive. Therefore it may be selected and an evolution has started. An autocatalytic network is a network of molecules, which catalyze each other’s production. Each molecule can be formed by at least one chemical reaction in the network, and each reaction can be catalyzed by at least one other molecule in the network. This process will create a network that exhibits a primitive form of metabolism and an information system that replicates itself from generation to generation. Credit University of Southern Denmark. Firstly long molecular strings are decomposed in water. This means that long information strings “break” quickly in water and turn into many short strings. Thus it is very difficult to maintain a population of long strings over time. “In our computer simulation – our virtual molecular laboratory – information strings began to replicate quickly and efficiently as expected. However, we were struck to see that the system quickly developed an equal number of short and long information strings and further that a strong pattern selection on the strings had occurred. We could see that only very specific information patterns on the strings were to be seen in the surviving strings. We were puzzled: How could such a coordinated selection of strings occur, when we knew that we had not programmed it. The explanation had to be found in the way the strings interacted with each other”, explains Steen Rasmussen. “An autocatalytic network works like a community; each molecule is a citizen who interacts with other citizens and together they help create a society”, explains Steen Rasmussen. “We might have discovered a process similar to the processes that initially sparked the first life. We of course don’t know if life actually was created this way – but it could have been one of the steps. Perhaps a similar process created sufficiently high concentrations of longer information strings when the first protocell was created”, explains Steen Rasmussen. The mechanisms underlying the formation and selection of effective information strings are not only interesting for the researchers who are working to create protocells. They also have value to researchers working with tomorrow’s technology, like they do at the FLINT Center. “We seek ways to develop technology that’s based on living and life-like processes. If we succeed, we will have a world where technological devices can repair themselves, develop new properties and be re-used. For example a computer made of biological materials poses very different – and less environmentally stressful – requirements for production and disposal”, says Steen Rasmussen. Increasing the oil content of plant biomass could help fulfill the nation’s increasing demand for renewable energy feedstocks. But many of the details of how plant leaves make and break down oils have remained a mystery. Now a series of detailed genetic studies conducted at the U.S. Department of Energy’s (DOE) Brookhaven National Laboratory and published in The Plant Cell reveals previously unknown biochemical details about those metabolic pathways—including new ways to increase the accumulation of oil in leaves, an abundant source of biomass for fuel production. Using these methods, the scientists grew experimental Arabidopsis plants whose leaves accumulated 9 percent oil by dry weight, which represents an approximately 150-fold increase in oil content compared to wild type leaves. “This is an unusually high level of oil accumulation for plant vegetative tissue,” said Brookhaven Lab biochemist Changcheng Xu, who led the research team. “In crop plants, whose growth time is longer, if the rate of oil accumulation is the same we could get much higher oil content—possibly as high as 40 percent by weight,” he said. And when it comes to growing plants for biofuels, packing on the calories is the goal, because energy-dense oils give more “bang per bushel” than less-energy-dense leaf carbohydrates. The key to increasing oil accumulation in these studies was to unravel the details of the biochemical pathways involved in the conversion of carbon into fatty acids, the storage of fatty acids as oil, and the breakdown of oil in leaves. Prior to this research, scientists did not know that these processes were so intimately related. 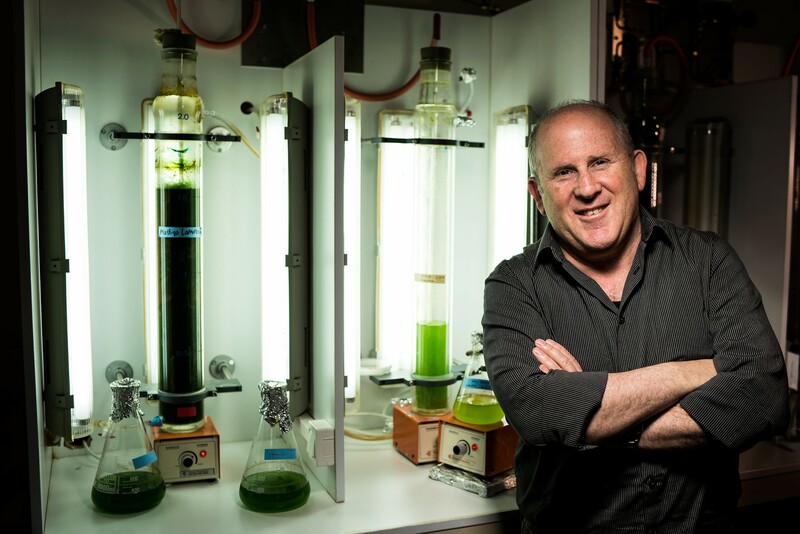 “We previously thought that oil storage and oil degradation were alternative fates for newly synthesized fatty acids—the building blocks of oils,” said Brookhaven biochemist John Shanklin, a collaborator on the studies. To reveal the connections, Brookhaven’s Jillian Fan and other team members used a series of genetic tricks to systematically disable an alphabet soup of enzymes—molecules that mediate a cell’s chemical reactions—to see whether and how each had an effect in regulating the various biochemical conversions. They also used radiolabeled versions of fatty acids to trace their paths and learn how quickly they move through the pathway. They then used the findings to map out how the processes take place inside different subcellular structures, some of which you might recognize from high school science classes: the chloroplast, endoplasmic reticulum, storage droplets, and the peroxisome. Brookhaven researchers Jilian Fan, John Shanklin, and Changcheng Xu have developed a method for getting experimental plants to accumulate more leaf oil. Their strategy could have a significant impact on the production of biofuels. “Our goal was to test and understand all the components of the system to fully understand how fatty acids, which are produced in the chloroplasts, are broken down in the peroxisome,” Xu said. Details of the oil synthesis and breakdown pathways within plant leaf cells: Fatty acids (FA) synthesized within chloroplasts go through a series of reactions to be incorporated into lipids (TAG) within the endoplasmic reticulum (ER); lipid droplets (LD) store lipids such as oils until they are broken down to release fatty acids into the cytoplasm; the fatty acids are eventually transported into the peroxisome for oxidation. This detailed metabolic map pointed to a new way to dramatically increase the accumulation of oil in plant leaves — blocking the SDP1 enzyme that releases fatty acids from lipid droplets in plants with elevated fatty acid synthesis. If this strategy works in biofuel crops, it could dramatically increase the energy content of biomass used to make biofuels. The research revealed that there is no direct pathway for fatty acids to move from the chloroplasts to the peroxisome as had previously been assumed. Instead, many complex reactions occur within the endoplasmic reticulum to first convert the fatty acids through a series of intermediates into plant oils. These oils accumulate in storage droplets within the cytoplasm until another enzyme breaks them down to release the fatty acid building blocks. Yet another enzyme must transport the fatty acids into the peroxisome for the final stages of degradation via oxidation. The amount of oil that accumulates at any one time represents a balance between the pathways of synthesis and degradation. Some previous attempts to increase oil accumulation in leaves have focused on disrupting the breakdown of oils by blocking the action of the enzyme that transports fatty acids into the peroxisome. The reasoning was that the accumulation of fatty acids would have a negative feedback on oil droplet breakdown. High levels of fatty acids remaining in the cytoplasm would inhibit the further breakdown of oil droplets, resulting in higher oil accumulation. That idea works to some extent, Xu said, but the current research shows it has negative effects on the overall health of the plants. “Plants don’t grow as well and there can be other defects,” he said. Based on their new understanding of the detailed biochemical steps that lead to oil breakdown, Xu and his collaborators explored another approach—namely disabling the enzyme one step back in the metabolic process, the one that breaks down oil droplets to release fatty acids. “This work provides another example of how research into basic biochemical mechanisms can lead to knowledge that has great promise to help solve real world problems,” concluded Shanklin. This research was conducted by Xu in collaboration with Jilian Fan and Chengshi Yan and John Shanklin of Brookhaven’s Biosciences Department, and Rebecca Roston, now at the University of Nebraska, Lincoln. The work was funded by the DOE Office of Science and made use of a confocal microscope at Brookhaven Lab’s Center for Functional Nanomaterials, a DOE Office of Science user facility. Scientists have figured out how to use a cell’s DNA repair mechanisms to spread traits throughout a population. 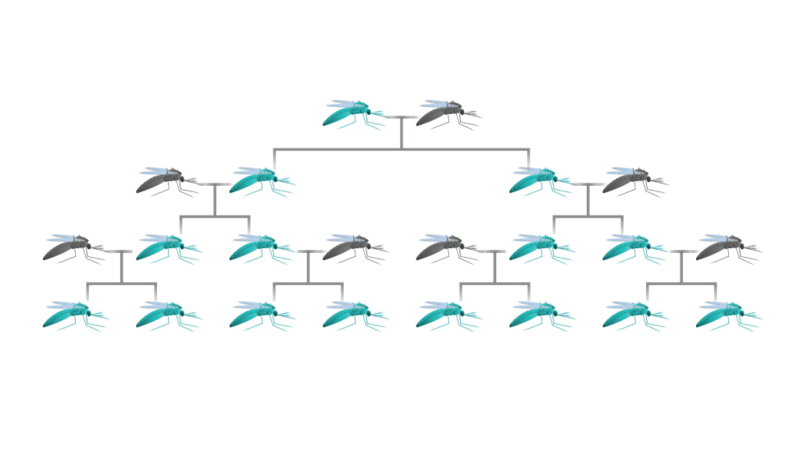 The first organism Esvelt wants to modify is the malaria-carrying mosquito Anopheles gambiae. While his approach is novel, the idea of controlling mosquito populations through genetic modification has actually been around since the late 1970s. Then, Edward F. Knipling, an entomologist with the U.S. Department of Agriculture, published a substantial handbook with a chapter titled Use of Insects for Their Own Destruction. One technique, he wrote, would be to modify certain individuals to carry “deleterious genes” that could be passed on generation after generation until they pervaded the entire population. It was an idea before its time. Knipling was on the right track, but he and his contemporaries lacked the tools to see it through. 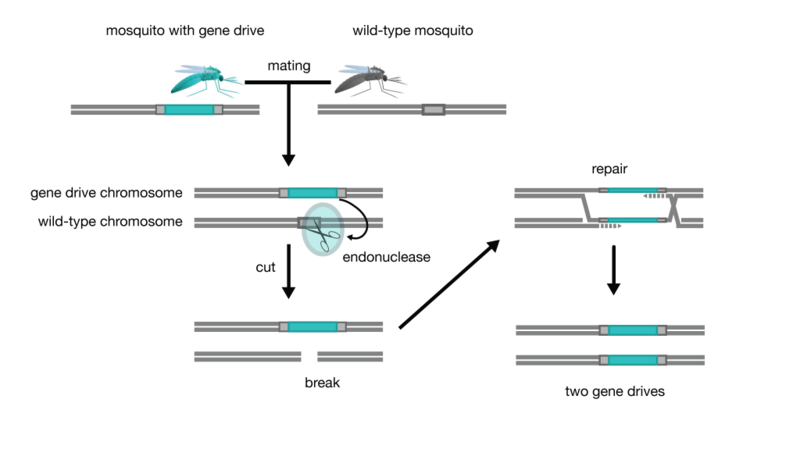 Here, a mosquito with a gene drive (blue) mates with a mosquito without one (grey). In the offspring, one chromosome will have the drive. The endonuclease then slices into the drive-free DNA. When the strand gets repaired, the cell’s machinery uses the drive chromosome as a template, unwittingly copying the drive into the break. In 1953, American chemist Stanley Miller had famously electrified a mixture of simple gas and water to simulate lightning and the atmosphere of early Earth. The revolutionary experiment—which yielded a brownish soup of amino acids—offered a simple potential scenario for the origin of life’s building blocks. Miller’s work gave birth to modern research on pre-biotic chemistry and the origins of life. For the past 60 years, scientists have investigated other possible energy sources for the formation of life’s building blocks, including ultra violet light, meteorite impacts, and deep sea hydrothermal vents. Now. for the first time, researchers have reproduced the results of the [Stanley] Miller-[Harold] Urey experiment in a computer simulation, yielding new insight into the effect of electricity on the formation of life’s building blocks at the quantum level. In this new study, Antonino Marco Saitta, of the Université Pierre et Marie Curie, Sorbonne, in Paris, France and his colleagues wanted to revisit Miller’s result with electric fields, but from a quantum perspective. Saitta and study co-author Franz Saija, two theoretical physicists, had recently applied a new quantum model to study the effects of electric fields on water, which had never been done before. 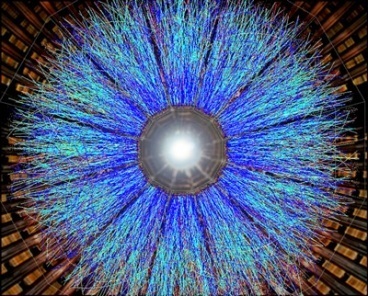 After coming across a documentary on Miller’s work, they wondered whether the quantum approach might work for the famous spark-discharge experiment. The method would also allow them to follow individual atoms and molecules through space and time—and perhaps yield new insight into the role of electricity in Miller’s work. As in the original Miller experiment, Saitta and Saija subjected a mixture of molecules containing carbon, nitrogen, oxygen and hydrogen atoms to an electric field. As expected, the simulation yielded glycine, an amino acid that is one of the simplest building blocks for proteins, and one the most abundant products in the original Miller experiment. A typical intermediate in the formation of amino acids is the small molecule formaldehyde. Formaldehyde – A typical intermediate in the formation of amino acids. But their approach also yielded some unexpected results. In particular, their model suggested that the formation of amino acids in the Miller scenario might have occurred via a more complex chemical pathway than previously thought. A typical intermediate in the formation of amino acids is the small molecule formaldehyde. But their simulation showed that when subjected to an electric field, the reaction favored a different intermediate, the molecule formamide. It turns out, formamide could have not only played a crucial role in the formation of life’s building blocks on Earth, but also elsewhere. For instance, formamide has recently been shown to be a key ingredient in making some of the building blocks of RNA, notably guanine, in the presence of ultra violet light. Formamide has also recently been observed in space—notably in a comet and in a solar-type proto star. Earlier research has also shown that formamide can form when comets or asteroids impact the Earth. Another key insight from their study is that the formation of some of life’s building blocks may have occurred on mineral surfaces, since most have strong natural electric fields. Their results are published this week in the scientific journal Proceedings of the National Academy of Sciences. Adding on, I think I read this in Hawking’s book, life as we know it is organic, but maybe at some other location or conditions in the universe, life didn’t have to depend on Oxygen, maybe there were other forms of life that didn’t need Earth like conditions! Experiments at the Department of Energy’s SLAC National Accelerator Laboratory solve a long-standing mystery in the role calcium atoms serve in a chemical reaction that releases oxygen into the air we breathe. The results offer new clues about atomic-scale processes that drive the life-sustaining cycle of photosynthesis and could help forge a foundation for producing cleaner energy sources by synthesizing nature’s handiwork. The research is detailed in a paper published Sept. 14 in Nature Chemistry. X-ray experiments at SLAC’s Stanford Synchrotron Radiation Lightsource (SSRL), a DOE Office of Science User Facility, played a key role in the study, led by Wonwoo Nam at Ewha Womans University in Korea in a joint collaboration with Riti Sarangi, an SSRL staff scientist. Photosynthesis is one of many important biological processes that rely on proteins with metal-containing centers, such as iron or manganese. The chemistry carried out in such centers is integral to their function. Scientists have known that the presence of calcium is necessary for the oxygen-releasing stages of photosynthesis, but they didn’t know how or why. The SSRL experiment used a technique known as X-ray absorption spectroscopy to explore the chemical and structural details of sample systems that mimic of the oxygen-releasing steps in photosynthesis. The basic oxygen-releasing system contained calcium and was centered around an iron atom. Researchers found that charged atoms, or ions, of calcium and another element, strontium, bind to the oxygen atoms in a way that precisely tunes the chemical reaction at the iron center. This, in turn, facilitates the bond formation between two oxygen atoms. The study also revealed that calcium and strontium do not obstruct the release of these bound oxygen atoms into the air as an oxygen molecule — the final step in this reaction. While the sample system studied is not biological, the chemistry at work is considered a very good analogue for the oxygen-releasing steps carried out in photosynthesis, she said, and could assist in constructing artificial systems that replicate these steps. The next step will be to study more complex samples that perform more closely to the actual chemistry in photosynthesis. Other participants in this research were from Osaka University in Japan and the Japan Science Technology Agency. The research was supported by the National Research Foundation of Korea and the Ministry of Education, Culture, Sports, Science and Technology in Japan. SSRL’s Structural Molecular Biology program is supported by the National Institutes of Health and the Office of Biological and Environmental Research of the U.S. Department of Energy. Imagine going to the hospital with one disease and coming home with something much worse, or not coming home at all. With the emergence and spread of antibiotic-resistance pathogens, healthcare-associated infections have become a serious threat. On any given day about one in 25 hospital patients has at least one such infection and as many as one in nine die as a result, according to the Centers for Disease Control and Prevention. Consider Klebsiella pneumoniae, not typically a ferocious pathogen, but now armed with resistance to virtually all antibiotics in current clinical use. It is the most common species of carbapenem-resistant Enterobacteriaceae (CRE) in the United States. As carbapenems are considered the antibiotic of last resort, CREs are a triple threat for their resistance to nearly all antibiotics, high mortality rates and ability to spread their resistance to other bacteria. But there is hope. A team of Sandia National Laboratories microbiologists for the first time recently sequenced the entire genome of a Klebsiella pneumoniae strain, encoding New Delhi Metallo-beta-lactamase (NDM-1). They presented their findings in a paper published in PLOS One, Resistance Determinants and Mobile Genetic Elements of an NDM-1 Encoding Klebsiella pneumoniae Strain. The Sandia team of Corey Hudson, Zach Bent, Robert Meagher and Kelly Williams is beginning to understand the bacteria’s multifaceted mechanisms for resistance. To do this, they developed several new bioinformatics tools for identifying mechanisms of genetic movement, tools that also might be effective at detecting bioengineering. Meagher first worked last year with Klebsiella pneumoniae ATCC BAA-2146 (Kpn2146), the first U.S. isolate found to encode NDM-1. Along with E.coli, it was used to test an automatic sequencing library preparation platform for the RapTOR Grand Challenge, a Sandia project that developed techniques to allow discovery of pathogens in clinical samples. 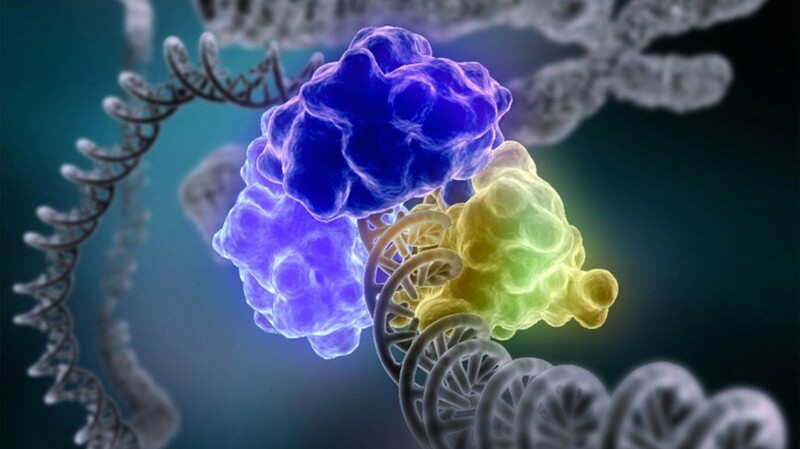 Assembling an entire genome is like putting together a puzzle. Klebsiella pneumoniae turned out to have one large chromosome and four plasmids, small DNA molecules physically separate from and able to replicate independently of the bacterial cell’s chromosomal DNA. Plasmids often carry antibiotic resistant genes and other defense mechanisms. “Each one of those genes has a story: how it got into this bacteria, where it has been, and how it has evolved,” said Williams. Klebsiella pneumoniae uses established mechanisms to move genes, such as “jumping genes” known as transposons, and genomic islands, mobile DNA elements that enable horizontal gene transfer between organisms. However, the organism has so many tricks and weapons that the research team had to go beyond existing bioinformatics tools and develop new ways of identifying mechanisms of genetic movement. Williams and Hudson detected circular forms of transposons in movement, which has never been shown this way, and discovered sites within the genome undergoing homologous recombination, another gene mobilization mechanism. By applying two existing bioinformatics methods for detecting genomic islands, they found a third class of islands that neither method alone could have detected. The findings are being applied to a Laboratory Directed Research and Development project led by Sandia microbiologist Eric Carnes, who is examining alternative approaches for treating drug-resistant organisms. “Instead of traditional antibiotics, we use a sequence-based approach to silence expression of drug-resistant genes,” said Meagher. The researchers also are applying their understanding of Klebsiella pneumoniae’s mechanisms of resistance and their new bioinformatics tools to developing diagnostic tools to detect bioengineering. Looking across 10 related but distinct strains of Klebsiella pneumoniae, they pinpointed regions that were new to their strain, and so indicate genetic movement.